Centrifugal juicers are usually the most affordable type of electric juicer. So are they worth buying? Here are the pros and cons of this type of juicer, so you can make the decision that is best for you. 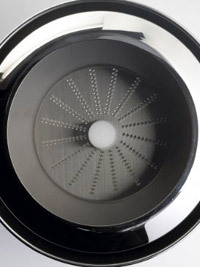 Centrifugal juicers have a mesh basket that spins and extracts the juice. You insert the fruit or vegetable into the feeding tube, and it hits the bottom of the basket. This grates the fruit or vegetable into very fine pieces and throws them against the sides of the basket. The juice is then extracted by centrifugal force. The leftover pulp is either ejected by the machine, or held inside the basket to be disposed of later. These types of juicers range anywhere from $40 to $200, making them the least expensive. They will work very well for the majority of fruits and vegetables. If you want to juice sprouts or leafy greens, this type of juicer may not work as well. The basket spins at a very fast rate, which can make the juice foamy and oxidize quicker…and that can destroy some of the beneficial enzymes in the juice. Also, the mesh basket may be difficult to clean…and you have to clean it every time you use the juicer. If you do a lot of juicing, look for a model that has continuous pulp ejection. That way, you won’t have to stop your juicing in order to keep clearing the accumulated pulp away. Also, a smaller feed tube may be better than a larger one. Although you can fit larger items, some of the smaller pieces can fall down inside the tube and never get grated…so you end up with less juice, and more waste. Finally, you may want to choose a model with a lower RPM. Higher RPM means more power and more juice, but also means more foam, and hence more oxidation and enzyme loss. If you want to make fresh, healthy juice for you and your family, centrifugal juicers are a good, affordable choice. Still not sure what kind of juicer to choose? Read about the different types of juicers, to find out more.